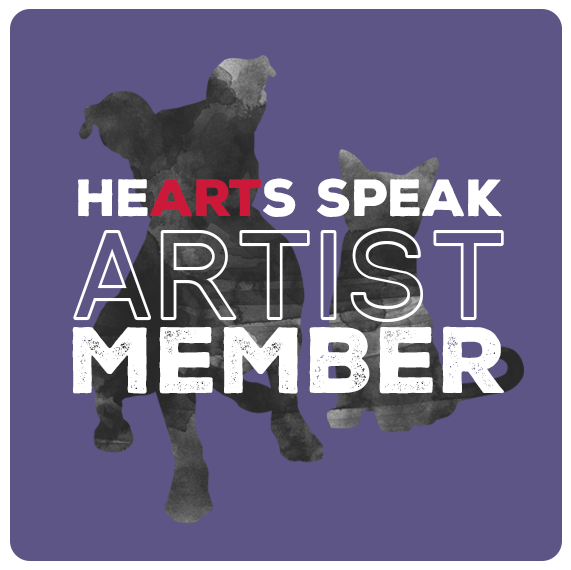 I am a member of HeARTS Speak, a global network of photographers, writers, graphic designers, sculptors, painters, illustrators and animal advocates who provide our time and professional services, pro-bono to animal welfare organizations in our communities. Our mission is to create a united voice for animals through art. My way of giving back is to provide money and artwork to help raise funds for animal rescue organizations. In addition, I volunteer with Friends of the Animal Shelter during Saturday morning dog play groups and am involved in their rabbit spay/neuter and foster program. I have previously served as a volunteer board member for Sanctuary One. In 2016, I began donating 100% of my sales proceeds to animal charities. Before that time, I was donating 10% of my profits, as well as original and reproduction artwork for animal non-profit fundraisers.